Jinja has for long been known as the host to the world’s longest river-River Nile. Many take a one-day Jinja tour to enjoy the fresh white-water activities however this isn’t enough. Taking more time discovering the secrets around the source of the Nile river and doing more activities makes a Jinja source of the Nile tour a memorable one. The only worry on a more than one day tour is accommodation in Jinja source of the Nile, that’s why this article is here to help identify for you all kinds of budget hotels. Jinja Nile Resort situated at the banks of the Nile River avails luxury safari accommodation. The hotel has amenities like River view or Nile facing rooms, Free WI-FI, laundry services, out door pool, restaurant, airport transportation, a health club and lots more breath-taking views. Hotel Paradise on the Nile is 700m from the source of the Nile situated along Kiira lane off Kiira road. The hotel is a 2min drive to the source of the Nile. Wildwaters lodge is nestled in a luxuriant rainforest on its own private island, mid-stream in the mighty Nile in Kangulumira along Kayunga road. 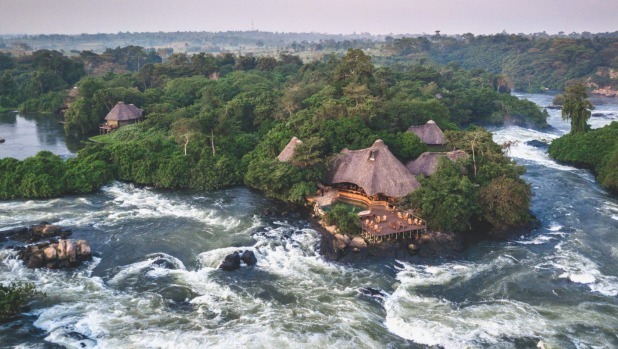 Each of the ten timber-floor rooms is nestled amidst the forest with private views over the River Nile and its rapids. Softly lit with handmade furniture, you can relax in comfort on this island paradise listening to the thunder of the Nile rapids, and the calls of the many species of bird who call the island home. Source of the Nile Hotel along Bridge street in Jinja offers the best quality services. The hotel has all kinds of rooms from executive to single rooms at affordable prices. Nile village Hotel & Spa on kiira road in Jinja a few meters from the source of the Nile river offers mid-range safari accommodation services. Source of the smile Hotel & Guest House offers an African touch with its setting. Sunset Hotel International limited in Jinja town along Kiira road is a Multi -story hotel that captures the essence and spirit of Jinja and provides easy access to cultural and tourism destinations. Al-Nissa Hotel & Spa situated in the heart of Jinja City and only 10 minutes to the source of the great river Nile offers guests the ultimate relaxation to rest and unwind. Brisk Recreation Hotel Triangle in Jinja offers an outdoor pool and views of the waters. The hotel has a spa center and water sports facilities, and guests can enjoy a meal at the restaurant or a drink at the bar. Every room comes with a TV, private bathroom equipped with a shower and free WIFI. DONOT miss heart pounding activities at the source of the Nile because of how to get there or where to stay in Jinja source of the Nile. The captivating natural beauty is waiting for you.